On Sunday, September 19th, we are having a harvest event at the community garden. 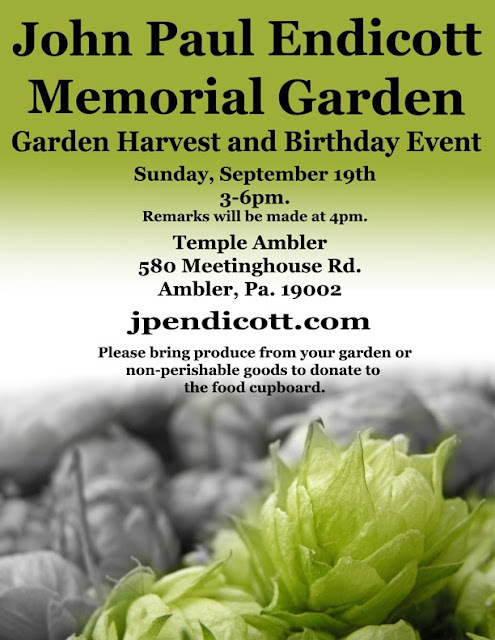 It is in celebration of John Paul Endicott, who's life was cut tragically short in July. We had a volunteer work day in August with John Paul's friends and family. This weekend's event will be a birthday celebration for John Paul. It will also be a chance for guests to learn about organizations that support growing vegetables for those in need and eating local such as Plant a Row for the Hungry, Weaver's Way Co-op, Whole Foods Market, and Mattie Dixon Community Cupboard. More information about Sunday's event can be found on the John Paul Endicott memorial website.